Proof the protesters we knew were defending the terrorists are in fact connected to the terrorists. An American umbrella group of the Boycott, Divestment, and Sanctions movement (BDS) against Israel facilitates tax-exempt donations to a Palestinian coalition that includes numerous U.S.-designated terrorist organizations, according to a new report. The U.S. Campaign for Palestinian Rights, a Virginia-based nonprofit that coordinates the efforts of 329 different pro-BDS organizations, is a fiscal sponsor of the Palestinian BDS National Committee (BNC), which is based in the West Bank and Gaza, Tablet magazine reported Friday. The BNC, created in Ramallah in 2007, counts the Council of National and Islamic Forces, commonly known as PNIF, among its members. 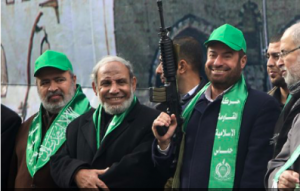 Five different U.S-designated terrorist organizations are members of PNIF: Hamas, the Popular Front for the Liberation of Palestine (PFLP), the Popular Front – General Command (PFLP-GC), the Palestine Liberation Front, and Palestinian Islamic Jihad (PIJ).